(Nanowerk News) By taking a “bottom-up” approach, researchers at the University of Illinois at Urbana-Champaign have observed for the first time that “size does matter,” in regards “pyroelectricity”—the current/voltage developed in response to temperature fluctuations that enables technologies such as infrared sensors, night-vision, and energy conversion units, to name a few. “Controlling and manipulating heat for applications such as waste heat energy harvesting, integrated cooling technologies, electron emission, and related functions is an exciting field of study today,” explained Lane Martin, an assistant professor of materials science and engineering (MatSE) at Illinois. “Traditionally, these systems have relied on bulk materials, but future nanoscale devices will increasingly require ferroelectric thin films. 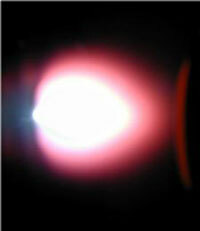 Using a high-power, pulsed laser to deposit materials from a plasma plume (shown here), researchers synthesized materials to study their unique pyroelectric properties at the nanoscale. “Measuring the pyroelectric response of thin films is difficult and has restricted the understanding of the physics of pyroelectricity, prompting some to label it as ‘one of the least-known properties of solid materials’,” Martin added. “This work provides the most complete and detailed modeling and experimental study of this widely unknown region of materials and has direct implications for next generation devices. Researchers found that reducing the dimensions of ferroelectrics increases their susceptibility to size- and strain-induced effects. The group’s paper, “Effect of 90-degree domain walls and thermal expansion mismatch on the pyroelectric properties of epitaxial PbZr0.2Ti0.8O3 thin films,” appears in the journal Physical Review Letters. According to J. Karthik, a MatSE graduate researcher and first author on the group’s paper, thin-film epitaxy has been developed to provide a set of parameters (e.g., film composition, epitaxial strain, electrical boundary conditions, and thickness) that allow for precise control of ferroelectrics and has been instrumental in understanding the physics of dielectric and piezoelectric effects. “We investigated the contribution of 90° domain walls and thermal expansion mismatch to pyroelectricity in ferroelectric PbZr0.2Ti0.8O3 thin films, a widely used material whose bulk ferroelectric and piezoelectric properties are well understood,” Karthik explained. As part of this work, Martin’s Prometheus research group developed and applied the first phenomenological models to include extrinsic and secondary contributions to pyroelectricity in polydomain films and predict significant extrinsic contributions (arising from the temperature-dependent motion of domain walls) and large secondary contributions (arising from thermal expansion mismatch between the film and the substrate). “We have also developed and applied a new phase-sensitive pyroelectric current measurement process to measure thin films for the first time and reveal a dramatic increase in the pyroelectric coefficient with increasing fraction of in-plane oriented domains and thermal expansion mismatch consistent with these models,” Karthik said. “By establishing an understanding of the science of these effects, with models to predict their performance, and demonstrated techniques to fabricate and utilize these properties in nanoscale versions of these materials, their properties can be effectively integrated into existing electronics,” Martin said.